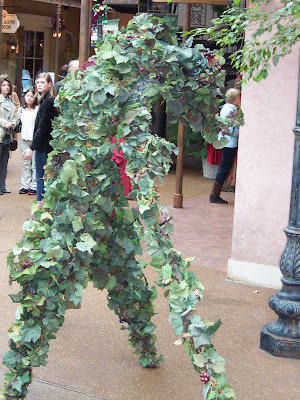 Susan and I were at the Gaylord in Nashville this weekend where we saw a very intriguing and unique performer. 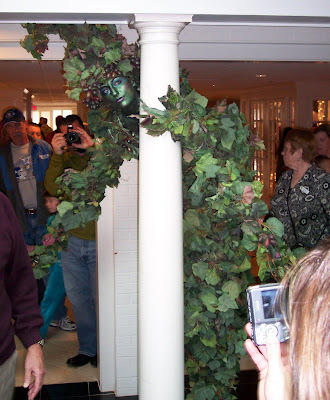 As we were walking along the sidewalk in the Delta area there was a large IVY vine on one of the walls. Just as we approached we heard several people gasp as the whole ivy vine started to move. 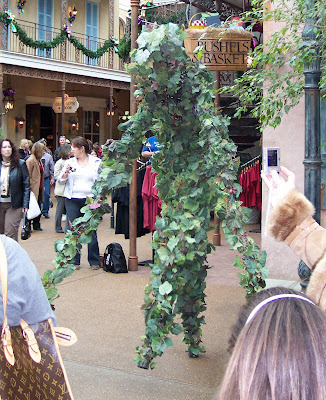 The "vine" was a young lady would was expertly disguised as a plant (and she was also on stilts). She moved around the area and stopped occasionally to strike various poses. It was a really neat performance. 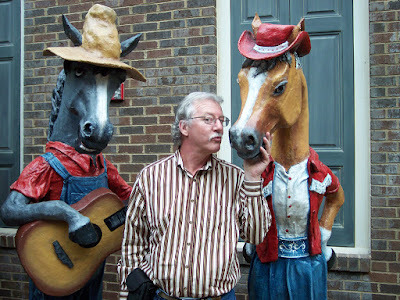 I know that I have seen video clips of these type performers before but I cannot remember where. If anyone does know please drop me a line. For the Photo Friday subject SUNRISE. I shot this on the way to work back in October at the Chicamauga Dam in Chattanooga, TN. Yeah, yeah. I know that this is a pretty poor picture of me looking really ragged, but I am very proud of this picture for several reasons. I shot this with my cell phone camera last Sunday at the Tennessee Riverwalk. I shot this at the five mile marker on the trail where I ran approximately 9 1/2 miles. By the way, I started at an area called the Frye Fishing Center which has an excellent park and a cafe called "OUT OF THE BLUE". It's just past the one mile marker. 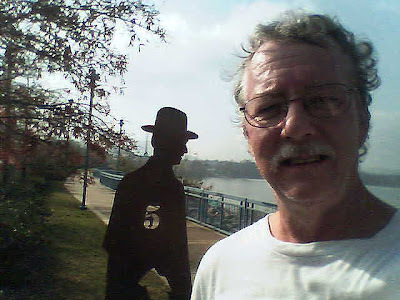 I ran (and walked) to the six mile marker before turning around. The weather last Sunday was great with temperatures in the low 70's (unlike today, a mere 7 days later, when we had snow flurries). This is my first real outdoor run after my lung surgery back in May. Oh, I do run approximately 5 1/2 miles 4 to 5 days a week at the gym but running on a treadmill just isn't the same as the great outdoors. Also, the dynamics of running outdoors seems entirely different than running on the treadmill. I do know one thing. I LIKE RUNNING OUTDOORS. I have to commend Chattanooga and Hamilton County for providing such a great park in which to run. The trail extends 8.5 miles one way, from the Chicamauga Dam to the Tennessee Aquarium. There are several rest areas with toilets and water and there is a great family park with a playground and snack bar that has great raspberry tea and deserts (as well as an excellent selection of kites!). This is time well spent and I plan on doing a lot more of it. I am hoping to get myself in good enough shape to run a race in the spring. We'll see how it goes! I tried planting some onions in this little garden spot two years in a row but something digs them up everytime. 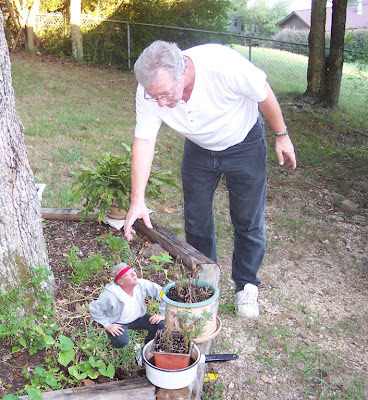 I just can't seem to keep the squirrels, cats, dogs, and other "pests" out of my garden! It's been awhile since I did any new Photo Friday projects. It seems as if I have spent almost every weekend since mid July working on the house. I titled the photo above "Missing" for the Photo Friday subject UNFINISHED. As you can see the chair would be finished were it not missing its' legs. Of course that hasn't stopped Susan from using it anyway as she loves to sit in it to read. The house painting is coming along nicely but I did run out of steam this weekend and did NOT finish everything that I wanted. I had hoped to finish the south end of the house but found several pieces of siding that begged to be replaced instead of repainted. That could have been a pretty tough job but my son-in-law Jeff came over and helped me with it. So far I've stolen the last three weekends from him and worry that I can never repay such a large debt. We finished replacing the siding about 2:30 on Sunday and then we called it a day and went swimming. First time that I've been swimming in the river in several years and it was fun. I was a little worried since I had not been swimming since my surgery. I didn't have a bit of trouble and it was actually very relaxing. I'll definitely have to try to relax more, swim more, and just plain try not to let life hurry me along to fast! Well, enough rambling for now. Here's a couple of pictures of the painting progress. I'm not lazy. Really, I'm not! Okay, it's been a while since I posted anything new, drawn anything new, or photoshopped anything new. I've been totally swamped at work ever since returning from my medical leave. I have huge piles of work all over my desk and most days I can't seem to get anything accomplished due to jumping from one disaster to another. Danged if I ever plan on having major surgery and being off work for weeks again anytime soon! On another note, I am doing much better and have just finished my first week with no pain medication stronger than Tylenol. I guess to prove just "how much better I am" I am painting my house! So far I have painted the garage, the front, and three sides of the second story. I have had to stop this week due to rain almost every afternoon but I do plan to finish this project on Saturday. I don't want this turning into another one of my 8 month remodeling projects like the famous back porch re-roofing project. Well, I hope to finish the painting and hopefully get inspired enough to draw, photograph, or photoshop something new. In the meantime you can enjoy this nifty video CHANGE MYSELF by Todd Rundgren. In case anyone out there wonders where I have been lately here's the short(est) version. Around the first of May I had a terrible stabbing pain in my chest, painful enough that I went to my doctor as quickly as possible. I had a chest X-Ray and then went home to await the results. I had just gotten back to the house and tried to relax on the sofa when my doctor called to say that there was something on my x-ray and that he scheduled me for a CT Scan the very next morning. I instantly thought through all of the worse case scenarios and had a fitful night. Next was the suspenseful part; after the CT Scan was completed I had a couple of days' wait for the results. About three days later I got a call saying that the CT Scan showed something and the I had now been scheduled for a PET Scan. A PET Scan? What is that?! I looked it up on the internet. It apparently has only one function which is to pinpoint cancers. I know that I am moving quickly here now but after the PET Scan the results took several days and then I got the dreaded call. Two masses in the upper lobe of my right lung had "lit up" the PET Scan, medical lingo for cancer. My doctor told me that if it was him he would not wait another day, he'd have it cut out just as quickly as possible. My wife and I went home to think things through and I started to try to plan being away from work for a while. The next weeks and half was nerve wracking. I worked at a frantic pace to try (unsucessfully) to catch up at work, to call friends, and to ask for family, friends, and anyone else who would offer to put me on prayer lists. I called people I had not talked to in months and months. When I finally felt that I could not wait any longer I had my surgery scheduled for May 18 and on that day I had the upper third of my lung removed. The doctor warned me it would hurt. "I'm tough", I thought. "I'm in good shape, how bad can it be?" I pondered smugly. The first two days were not too, too bad. I had a chest tube protruding from my torso. I had a catheter (a rather unpleasant thing in itself). I had a epidural with a button that I could push to administer pain killers directly into my spinal canal (a great invention that lulled me into a false sense of ease). 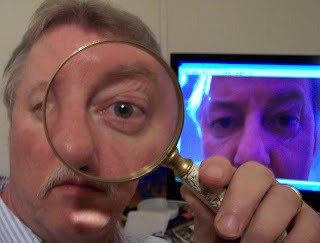 I muddled through the next few days, resting fitfully, waiting for the pathologist report. I got my 52nd birthday present one day early this year. I got the official word that the growth in my lung was not malignant. NOT MALIGNANT! Did you hear that?! NOT MALIGNANT! I will not have to undergo chemo or radiation. I will recover from this. I had all the tubes and hoses removed on Tuesday the 22nd. That's when the real pain began. The epidural had been saving me from the worst of the pain and now I was on my own. They tell me that I will hurt for weeks, maybe months. I cannot really say that the pain has diminished yet. I sleep fitfully a few hours at a time and have a heck of a time getting out of bed and off the sofa. I worry about my job although I know that people there are very supportive of me and are taking care of my work in my absence. I am extremely lucky to work with such great people. I will survive this. I smoked heavily for 30 years of my life. I quit smoking 5 years ago which may have been just in time. I will have to see a pulmonary doctor every three months for years. To my children Tiffiny and Michael and my youngest sister Dana: Please stop smoking now. You don't have to experience what I am going though right now. Since it's been a while since I last posted anything on my blog I thought that I would display the image above. The base image (lanscape) was created with a freeware program called Terragen. 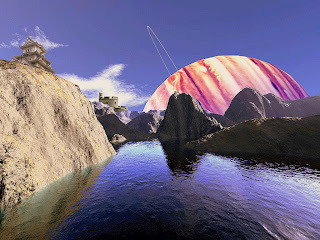 I then created several layers and added the castles and planet with Photoshop. Merging the various layers produced the end result above. I am still learning how to use the Terragen program but it IS fun to create landscapes from scratch. After a very trying week and quite a few late nights I now have my computer back up and running. While this is good in a way the downside is that I had to reformat drives and completely re-install Windows from scratch. Now to see if I can recover all my photos, art, and music which I backed up prior to re-formatting. Well. 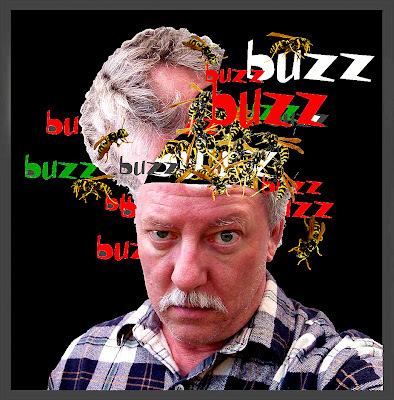 I've been bit, infected, infested, or whatever term you choose to describe something taking over my computer (I am posting this from work instead of from home). I can no longer get online at home. Oh, the computer IS connected to something on the web. For you techies out there I CAN "ping" almost any site that I choose. I can even ping my email server. I just cannot connect with any of them. I cannot get my email. I cannot visit ANY website. I can not run a virus scan on my computer. Wednesday I installed the latest, greatest Norton 360 (virus protection, firewall, online security suite, etc.). Everything seemed to go okay Thursday but when I got home on Friday I could not get online. Tried to reset the computer back to a time when things worked okay. Nope, no good!. Restored back to a month ago. Nope, no good!Restored back to Wednesday night and now the new Norton 360 is gone altogether. Won't re-install either. And now to make matters worse my wife can no longer access her email using Outlook Express and cannot log onto AOL. Everything else works for her on her computer but those items. It's like some form of "Denial of Service". I have noticed that my cable modem and routers' activity lights flicker like crazy (indicating "something", what?, who knows?). Have we been taken over by some devious "Bot" network? I just don't know. Can a trojan, virus, or malware bot take possession of a cable modem or router? My cable modem always seems to be busy as heck even when both computers are shut down. IS this something caused by Norton 360? Was it caused by a trojan or virus? I don't know. What I do know is that two computers at my house are about to get wiped clean and re-formatted. Man! I hate doing this. Having to re-install programs, re-creating web links and favorites, etc. If anyone else is having similiar trouble let me know. I'd really like to know if there is a simpler solution to this problem. I just can't afford to pay a networking or IT guy 60 bucks an hour to figure this all out. For the ILLUSTRATION FRIDAY subject GREEN. 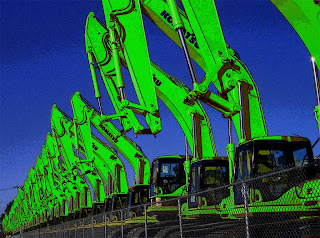 I used Photoshop 7 to replace the yellow color of the heavy equipment with green and then used several filters to digitally alter the appearance of the image. I have been wanting to take a picture of this equipment for quite a while now but for some reason or another never seemed to make the time. This was shot at the Komat'su equipment manufacturing plant on Signal Mountain Boulevard in Chattanooga. 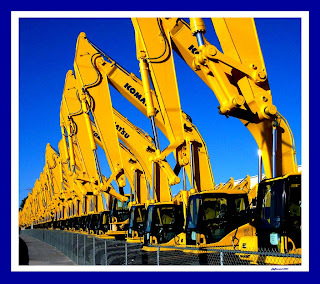 To me this is just an awesome sight when there are 30 to 50 completed machines lined up side by side. This was shot on Easter Sunday, April 8, 2007. 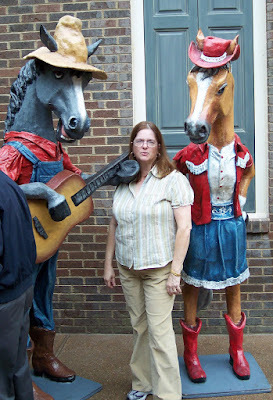 I recently had the opportunity to vist the Gaylord Opryland Hotel as a guest of my best customer. While the room was just an average hotel room the hotel on a whole is fantastic. The landscaping is exquisite. There is at least 7 acres under roof. The hotel is divided into three main areas all under glass with pools, waterfalls, an indoor river complete with boat rides, and what looks like a slice of the French Quarter. The plants were beautiful and you could get lost within this enclosed landscape. There are restaurants, boutiques, game rooms, a spa and fitness center, radio station, and much, much more. I highly recommend a visit to this hotel as it is a complete destination in itself. I've also posted some other pictures on my FlickR page. The Photo Friday word for the week of Febbruary 23 - March 1 is TEXTURE. 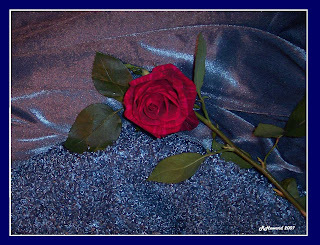 This is my entry which includes several varying textures ie: Rose Petals, Thorns, Velvet, and Knap. I haven't posted anything in a while and felt the need to upload this entry for the PHOTO FRIDAY subject: Self Portrait. I made this one several months ago while goofing off. I cannot see my own blog. Very annoying. My pic for the PHOTO FRIDAY subject Brother. 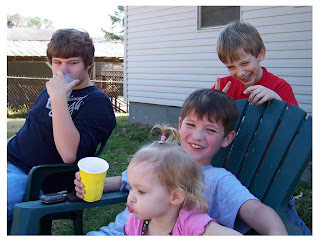 From left to right, back to front: My grandson Blake, grandson Braxton, their cousin Austin, & my granddaughter Micah. 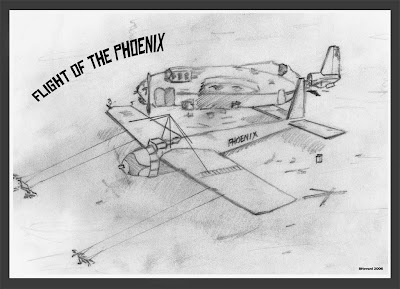 My sketch for the Illustration Friday subject Phoenix. While I am sure that most thought of the mythical bird I instantly thought of the 1965 film Flight Of The Phoenix with James Stewart; possibly one of the greatest movies of all time. Certainly one of my top five.